Everyone is a pedestrian at some point, whether you are walking to your destination or simply from your home to your car. Anytime you must travel on foot on a sidewalk, street, on in another developed area, you are considered to be a pedestrian. This may include walking, jogging, running, or even standing on a corner. Pedestrians commonly travel in close proximity with motor vehicles, including cars, SUVs, large commercial trucks, motorcycles, and more. Even if drivers pay attention to the other traffic on the road, many may fail to remember to pay attention to pedestrians who may be crossing the street or walking along the side of the road. For this reason, collisions between motor vehicles and pedestrians often occur, causing serious injuries and even deaths. The Pennsylvania Department of Transportation reported that, in 2012, there were 4,317 collisions between vehicles and pedestrians, resulting in 4,548 injuries and 168 deaths. If you have suffered injury in a pedestrian accident, an experienced Pittsburgh personal injury attorney can help you recover. Determining fault in a pedestrian accident is extremely important. If a person or party was negligent and caused your injury, that person should be held responsible for all your injury-related losses. Because pedestrians have no protection from motor vehicles when they are involved in a collision, pedestrian accident victims often suffer devastating injuries. Additionally, pedestrians often have more than one point of impact, so they can suffer multiple injuries. For example, the bumper of a car could hit a pedestrian in the knees, causing the pedestrian to bounce off the hood of the car, then go over the roof of the car, hitting multiple spots before landing on the pavement. These are, of course, only a few examples of common injuries that victims of pedestrian accidents may suffer. After an accident, victims usually face medical bills, lost income, pain and suffering, emotional trauma, and more. Some even have permanent disabilities and can never work again. Victims deserve to receive an award for the full range of losses from the responsible party, and an attorney can help you determine how much money you deserve. 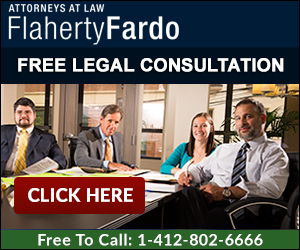 If you have been injured in a pedestrian accident, the highly skilled and experienced personal injury lawyers at the law office of Flaherty Fardo can help you pursue a claim against the responsible party. In Pennsylvania, you only have two years to file a claim from either the date of the accident or from the time you discovered (or should have discovered) your injury. Therefore, you should not delay in contacting our office at (412) 802-6666 to schedule your free consultation.